A while ago, I wrote a post about using Microsoft Word 2007 and Live Writer as a blog writer and publisher. I have always written all of my posts in Microsoft Word but manually copied them up to my WordPress blog. With Word 2007, I would occasionally do all of it, including posting, directly from Word. My only gripe with the process was image management. I thought word did not manage the posting process of images as effectively as doing it all directly in WordPress. Of course, I do not think I really should expect Microsoft Word to be as efficient as publishing blog posts in WordPress as WordPress, but one could always hope. Today, I upgraded to Office 2013 and wanted to see if anything has changed. The good news is that it is almost identical as the earlier versions of Word for creating and publishing blog posts. Establish Your Blog Account by Clicking on Managed Accounts (in the Blog group of the Word Ribbon Menu). 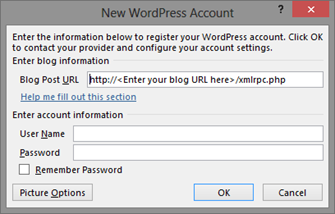 Once you click on managed accounts you will be asked to enter in your blog provider, credentials, and your blog URL. Word does pass this information via clear text over the Internet so if you are security concerned, then use the traditional copy and paste of your text and post directly from WordPress or other blog platform. Insert Desired Images: This is where things got a little interesting. I would capture images and drop it into Word and then manually scale them down. However, being a good blogger I want to minimize the time it takes for all these images to download when you view the post. While I could crop easily enough in Word, I was not able to force my scale to become the native resolution of the image. If I wanted to do that, I would have to pull the image out of Word edit it in GIMP and then put it back. I did use the Compress Image function. Start by selecting the image, and then go to the Word ribbon bar and choose Picture Tools Format. In the Adjust group in the ribbon bar, there is a small icon for Compress Pictures. Smaller is better as it will speed you page loading. PPI is only used for printing, so there is no need for a large value.